Many homeowners here in the Reno/Tahoe area are opting to create a more lived-in feel by installing Rustic hardwood flooring. 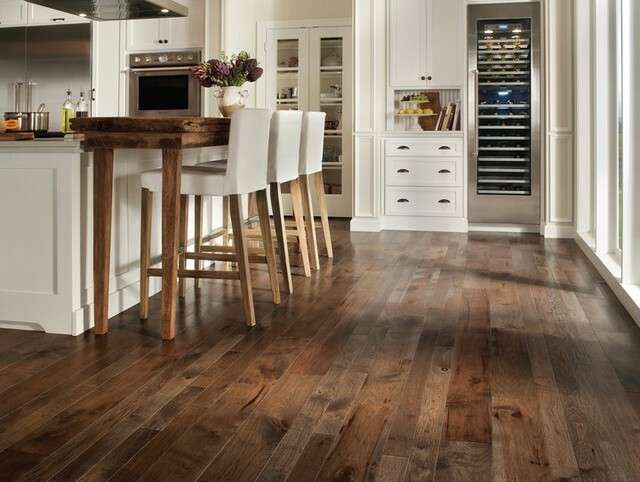 Rustic flooring is a timeless classic, which everyone agrees will never go out of style. It imbues a feeling of lasting connection to the past and perhaps a nostalgia for an easier, slower paced life. Rustic hardwood flooring also speaks of a more lived in home, where people can relax, let their hair down and be themselves. This is as opposed to some of the more modern looks, which seem to impart feelings of shiny newness and chrome accents. What Do I Mean by Rustic Hardwood Flooring? Rustic and lived-in simply mean aged, perhaps hand scraped and distressed, with mottled colors and tone. In much the same way new furniture can be “antiqued,” a new hardwood floor can be made to appear as if it is a well used, well loved, time-worn floor with a history. The tones tend to be warmer, the surface less shiny, and always a feeling of easier forgiveness of spills, scratches and dents, qualities which anyone who owns pets or has children can easily appreciate. Hand distressed hardwood floors are a very affordable way to create that lived-in feeling, if you are working with a tighter budget. Before the advent of antiquing and hand distressing fresh hardwood prior to installing it, the practice of reclaiming hardwoods from old barns and other buildings was very popular. Every mark, scratch and dent told a story. Kerf marks from long forgotten sawmills lend a beauty to hardwood floors, all their own. Some people take great pride in telling their guests and visitors that the floors they are walking on used to be the walls of some well-known French winery, or the saloon of a long dead mining town. The lived-in feel created by those reclaimed rustic hardwood floors is always palpable and unmistakable. Be prepared to pay the premium. At Artisan Hardwood Floors, old world craftsmanship is our standard practice. My team and I have experience with every kind of hardwood flooring installation and restoration imaginable. We are experts in the field, and understand all the unique requirements of hardwood floors in our ever-changing local climate. We can be cold and dry one day, hot and humid a week later, then get six feet of snow the following month. Understanding the requirements of your rustic hardwood floor installation in your particular neighborhood, while maintaining your budget, requires years of experience in the area. I would love to speak with you about how we can create a more lived-in feel in your home by installing rustic hardwood floors.